Mark Dvoretsky, the world’s best-known chess trainer, has died today at the tragically early age of 68. His death was reported by the Russian Chess Federation, with a minute’s silence held at the start of the Tal Memorial. Mark was a talented player who switched to coaching at an early age and became a mentor for generations of top players. He shared his knowledge with the chess world at large in highly-regarded books, and was always open to new ideas, as we saw at first hand when he came to Hamburg earlier this year to film chess videos. It seemed at the time that was just the beginning. Mark Izrailovich Dvoretsky was born in Moscow in 1947 and graduated in Mathematics from Moscow State University. 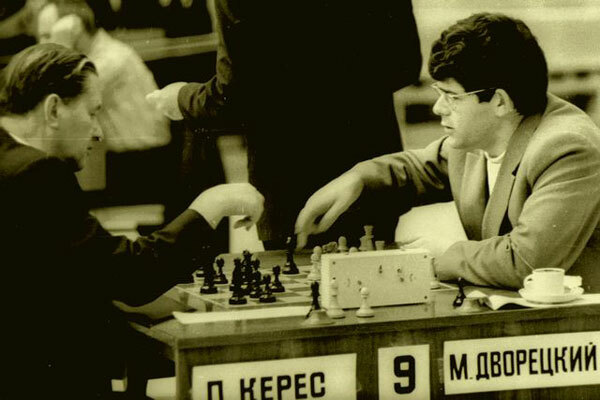 He became a chess professional and rose to prominence in the early 1970s, winning the 1973 Moscow Championship, finishing in a tie for 5th place in the formidable 1974 USSR Championship and making a name for himself internationally when he won the 1975 Wijk aan Zee B tournament by a full 1.5 points. In the same year he received the International Master title and, according to Chessmetrics, was the world’s 20th best player. The grandmaster title (much harder to obtain back then) was surely just around the corner, but then Mark took the decision to turn his back on playing and become a coach. His subsequent career was glittering, as his many students – Artur Yusupov, Sergey Dolmatov, Aleksey Dreev, Nana Alexandria, Viorel Bologan, Ernesto Inarkiev, Alexander Motylev, to name but a few – rose to the heights of world chess. Together with Artur Yusupov he held a chess school that attracted the likes of a young Peter Svidler and he went on to author two dozen books, including the seminal Dvoretsky’s Endgame Manual. Do you now regularly work with any promising chess players? No. At some point I realised that one of the factors of success (my work was almost always successful, over the course of my whole life) was that I completely immersed myself in the job. I thought all the time about the problems of my students, paying attention to the smallest details. Purely based on erudition, on technique, you can demonstrate some interesting things, but you can only really be a good mentor when you fully throw yourself into the work. With age I now have less energy, and when serious health problems arose I sensed that however well I got on with a student it was very hard to maintain his interests and problems at the centre of attention – my own business distracted me. Therefore I no longer have students who I guide on a constant basis. He went on to produce two video series, Endgames with Dvoretsky and Calculation with Dvoretsky, and we were hopeful he would return to Hamburg in the future to film further material. We’d like to express our deepest condolences to Mark’s family and all who knew him. May he rest in peace.